This is easy to use, easy to apply and quick drying (2-3 minutes a coat). And it is a one coater too!!! It's a nice creamy blue colour. Lasted well. its a pretty blue color!!! Beautiful blue color. I like it! What a lovely blue that is! Really pretty classic light blue! It's really impressive that it's a one coater! Cor bonitinha, lindo mesmo é o vidro. It is gorgeous - and one-coaters in pastel/light colors are so lovely! 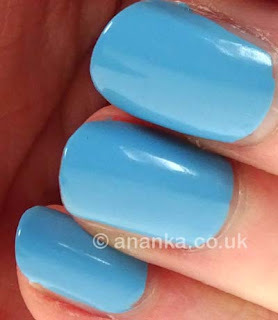 This is a really pretty summer colour!